I haven't posted for a while because I have been so busy. Here is a photo of this year's Boom Town. 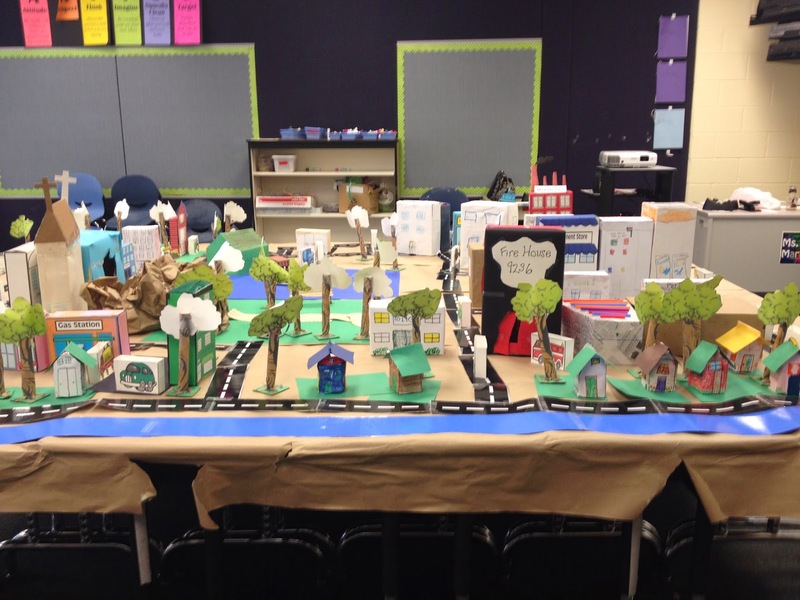 We read this crop of first graders the book of the same name and then built a town of our own. I had previously subbed in all the classes and discussed ecosystems and habitats and how important it is to keep them in balance. Because just one thing being out of order, everything can be off. The kids had been learning about natural resources in science. That's why we made the frog hats in a previous post on "frog day." 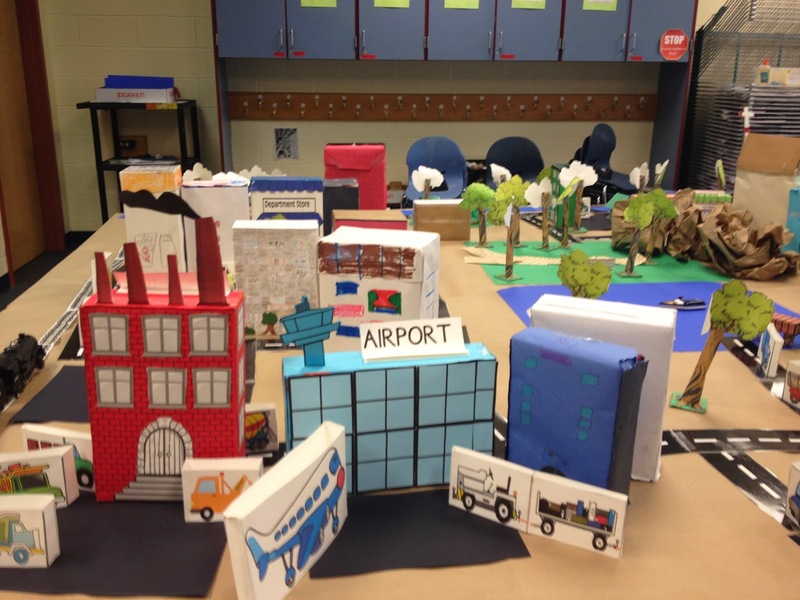 I have been researching City Planning for four years while doing this project every year. The most important information that I found (and it made this year's project go even better) was that there are FIVE AREAS of a town: residential, commercial, industrial, community (schools, libraries, etc.) and green space. See the brick factory above. That was built because the only ore or natural resource we could find on our pretend land was clay. So the kids shouted, "Let's build bricks." I had made the box beforehand, so our town had a beginning place. We pushed 24 desks together and covered them with brown paper. I crumpled up three big pieces for "rocks." I started with the residential area. After discussing what a municipality was, we had our first town meeting. The kids got to vote on everything that was placed in the town. There was some yelling happening, but we all just laughed and told them that people did get mad when their neighborhoods were concerned and businesses might be built too close to their houses. I had put the river along one edge of the town with the lake in the middle. I placed these two natural resources differently for the next session. I described two cities that I had visited. The first was Charleston, S.C. I told them it was one of the first cities built in the United States and that George Washington had visited it. I told them that their were houses built all along the riverfront. Then I described Willmington, N.C. where the shops were built along the riverfront, and that it was a big tourist attraction. The planning meeting had to make their first big decision. As you can see in the picture above, they chose to put their milk carton houses along the river. 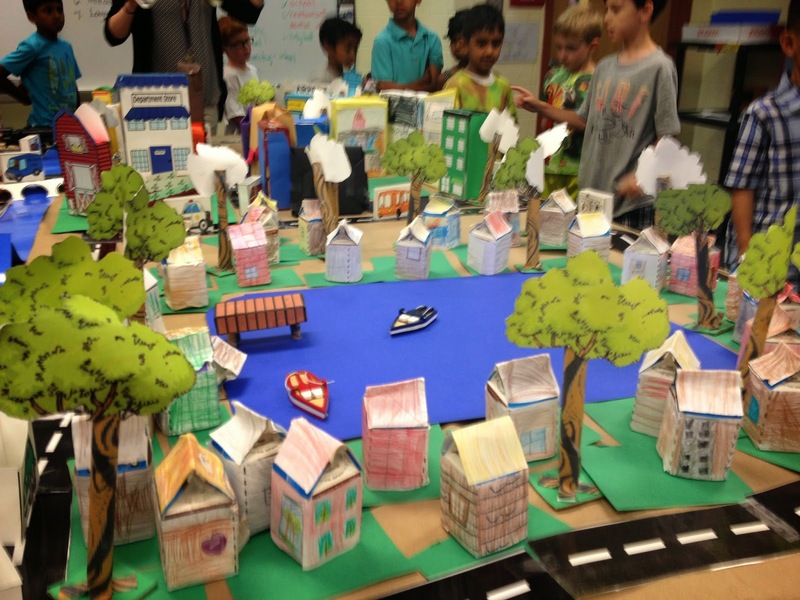 The second group decided to build their residential area around the lake. In four years, not one of eight groups ever decided to build their houses around the lake. (I think the ecosystem talk had really worked). I built the little dock last year. I will update this more tomorrow after I mask out the kids faces.